Akismet is the spam filtering plug-in developed by Automattic Company who had developed WordPress. Since most of the blogs are on WordPress and the default spam filtering option on them is Akismet, that’s why I am talking about that only. When you post a comment on a blog and if comment moderation is ON for that particular blog then your comment will not appear on that instant. Blog owner/admin will have to approve your comment and then only your comment will be visible to others. But what if your comment is moving into Spam folder? Spam folder in wordpress blogs is maintained by Akismet and if Akismet feels that the comment just posted by you or others is not following the rules of ethical or human comment then it will move your comment into Spam folder. 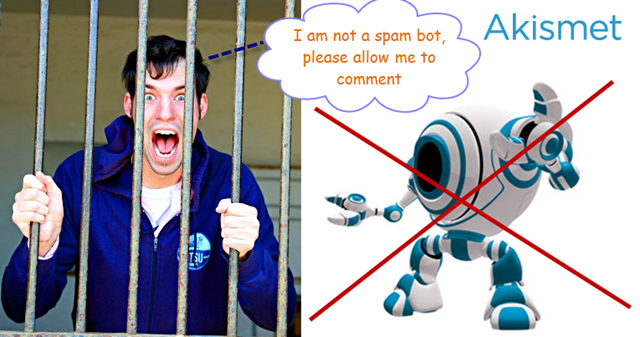 Akismet is designed in such a way that it should protect wordpress blog from spam bots or programs. But if it blocking your comments as well then you will feel helpless because you are putting lot many effort and time to post comments on different blogs and it is really frustrating that they are not appearing over there. Don’t Worry, Here Is The Solution! If you are facing this issue as I was facing the same few days ago the follow the simple procedure to get it resolved. 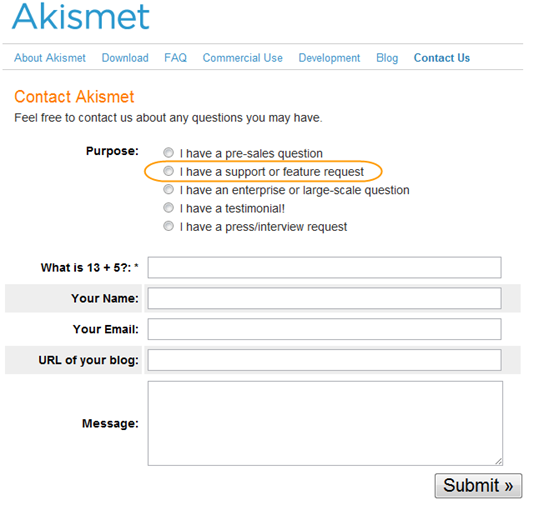 You need to contact Akismet team with your issue thru their contact form and then they will come up with a filtering changes in their system so that your comments will not move into spam folder. Here is the link for Akismet contact form. Choose “I have a support or feature request” section for explaining them your issue and then provide the details about your Email ID, Name and URL which you uses regularly for posting your comments. Akismet team is very much prompt in responding the issues. They will reply you with details and then onwards you will not find your comments on other blogs in spam folder.